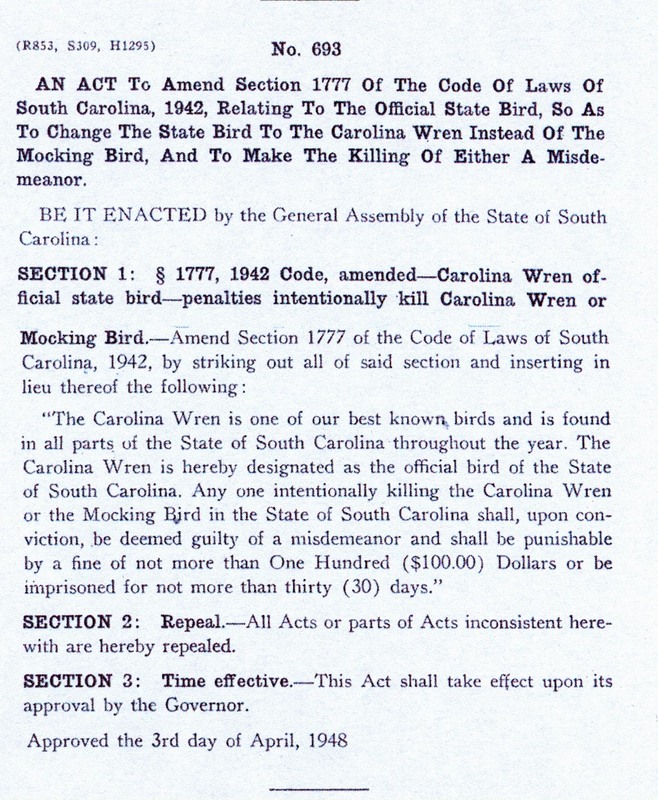 South Carolina SC Facts & Firsts SC State Symbols SC State Bird The Carolina Wren, sometimes referred to as the Great Carolina Wren, was adopted as the South Carolina state bird in 1948, replacing the Mockingbird. It can be found in a wide variety of habitats including fields, woodlands, and swamps. Carolina Wrens build their nests in the holes of trees, on fence posts, or in the eaves of houses and barns. However, the wren is also known for nesting in unusual places such as bags, boxes, flower pots, and even shoes. Both the male and female participate in nest-building, but the female generally adds the finishing touches prior to laying her eggs. There are countless types of wrens, including the Stripe-Breasted Wren and the Marsh Wren. The Carolina Wren is unique because only the male sings loudly (not the female), in order to attract his mate. The couple remains together for life. A female lays up to three broods (or sets) of eggs each year. The eggs are light and creamy in color, and are speckled with reddish-brown. There are usually 3 or 4 eggs per brood, and they take 14 to 16 days to hatch. Hatchlings leave their nest within two weeks. Once gone from the nest, they are called fledglings, and their parents continue to visit and feed them until they are approximately four weeks old. The Carolina Wren can be recognized by the white stripe that runs above each eye and its distinctive "tail-up" posture. The song is a familiar one throughout South Carolina, resembling the words "tea-kettle-tea-kettle-tea-kettle-tea." Hilton Pond Center, "Carolina Wren: The South Carolina State Bird"
National Geographic profile and photo - photo can be downloaded for your computer's "wallpaper"